They're all here--every X-bomber and X-fighter since 1942. On October 2, 1942, the Bell XP-59 Airacomet soared up and away from present-day Edwards AFB, launching the US Army Air Forces into the Jet Age. In the several decades since, hundreds of new variations of experimental and test turbojet-powered bombers and fighters--X-bombers and X-fighters--have taken explosive flight. These aircraft blazed a trail leading to today's B-2 Stealth Bomber and F-35 Joint Strike Fighter. 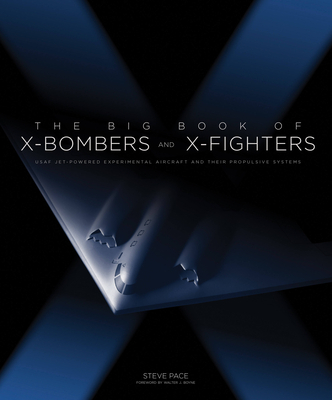 TheBig Book of X-Bombers & X-Fighters showcases all of the USAF jet-powered X-bombers and X-fighters that have flown since 1942--more than 90 in all, including the alphabet soup of their variants. From experimental to prototype service bombers and fighters--from the XB-43 to the B-2A and the XP-59A to the F-35A--they're all here, with their inside stories revealed. Some of these aircraft were further developed. Others were canceled. All stretched the performance and design envelopes. More than 250 photos illustrate all of these experimental aircrafts' cutting-edge features and zeroes in on histories of their design, flight testing, and weapons testing. Specification tables detailing performance, design, and armaments help round out this compendium of information on truly groundbreaking aviation designs. In addition, veteran aviation author Steve Pace shows readers some of the designs that could have been and offers a peek into what might be lurking in the future, making this the definitive guide to USAF jet-powered experimental aircraft! Steve Pace is a freelance aviation history writer, a contributing editor to Flight Journal, and the author of numerous articles and short features on a variety of aircraft and related subjects, as well as thirty aviation history books, including The Big Book of X-Bombers and X-Fighters (2016). He was raised in Seattle, Washington, where his father worked at the Boeing Airplane Company for more than thirty years. As the son of an aircraft builder, he became interested in aviation at an early age - instead of buying candy and marbles, he bought model airplane kits. Pace now resides in Tacoma, Washington. "Pace's prose is conversational and succinct making for the rapid sense of aviation evolution as it must have felt at the time. Every sentence is filled with facts - no fluffing about - as he covers the vast array of X-aircraft in this beautifully crafted book. The book is fully sourced and is useful as a research reference. It is comfortable at home in the personal library, desk of coffee table where it can be randomly opened to any page for enjoyment. But read it cover to cover to understand the history Pace has so elegantly placed before the reader - the history of jet aviation. " "Pace's focus on the history of experimental jets is a strong, informative history of the peak years of big budget planes built for big wars. It may be a finite history: the $1.5 trillion F-35 program gets the last part of the penultimate chapter, and its decades of development, towering costs, and likely middling combat experience are souring the American public, Congress, and the Pentagon on giant expensive super-planes. X-plane programs may no longer be the future of war, but The Big Book of X-Bombers and X-Fighters is an excellent travel through the Planes of Future Past." "The first jet airplane built and flown in the United States was the Bell Aircraft Corporation's P-59 Airacomet. From there, jet airplanes have a surprising and complex history. Popular Science reviews Steve Pace's "The Big Book of X-Bombers and X-Fighters" and showcases some incredible photography in the process." "I am no great expert but it appears to be meticulous study and a ‘go to' book for anyone interested in or researching the field of experimental military aircraft. If this is your territory I suggest that you need to get yourself a copy!" "Longtime aviation writer Steve Pace is best known for his insightful histories of pioneering aircraft from the glory days of Edwards Air Force Base. His latest book is his best yet." "I love - love - Steve Pace's The Big Book of X-Bombers and X-Fighters, out now from Zenith Press. X-Bombers and X-Fighters is too exhaustive to review in the conventional way. So I'm not going to bother trying. Instead, this week I'm going to spotlight a few of the shiniest gems of aeronautical design among the many dozens in Pace's giant, beautiful book. Buy it. You'll be glad you did." "IF YOU LIKE POINTY-NOSE JETS, you’ll love this book. The author, the late Steve Pace, catalogs every single jet-powered experimental bomber and fi ghter fl own by the U.S. Air Force, beginning in 1942. With more than 250 photographs, the book is a joy to browse: Page after page of swept-wing prototypes that soared over the dry lakes of southern California, their descendants ready to scramble during cold war tensions with the Soviet Union. The book, which includes profi les of aircraft from North American’s XB-45 to Lockheed’s YF-117A, is a testament to the prolifi c imagination of U.S. aeronautical engineers working over the past 70-plus years."